The Granite State Clean Cities Coalition (GSCCC), a program hosted at NH Department of Environmental Services (NHDES), along with the NH Automobile Dealers Association (NHADA), presented a check for $2,744.25 to the New Hampshire Motor Speedway (NHMS), Speedway Children's Charities (SCC) following the successful Green Your Fleet! event held recently at the Speedway. Green Your Fleet! is a biennial event of the Granite State Clean Cities Coalition (GSCCC) targeting fleets and municipalities that focuses on alternative fuel and advanced vehicle technologies. This year's event drew over 200 attendees and included 25 speakers discussing important industry trends and issues. It also included an electric vehicle show and ride & drive opportunities on the NHMS track and race course. "To be able to hold the event at such a great and unique venue as NHMS really makes Green Your Fleet a popular and worthwhile event, getting to kick the tires and in some cases punch the pedal of the new and upcoming electric vehicles that are the future is a great opportunity," says Dan Bennett of NHADA. The GSCCC is a collaborative of over 120 public and private interests from all regions of NH dedicated to supporting the goals of reducing dependence on foreign oil, and improving air quality, through the use of domestically produced, cleaner burning alternative fuels and other fuel reduction strategies. 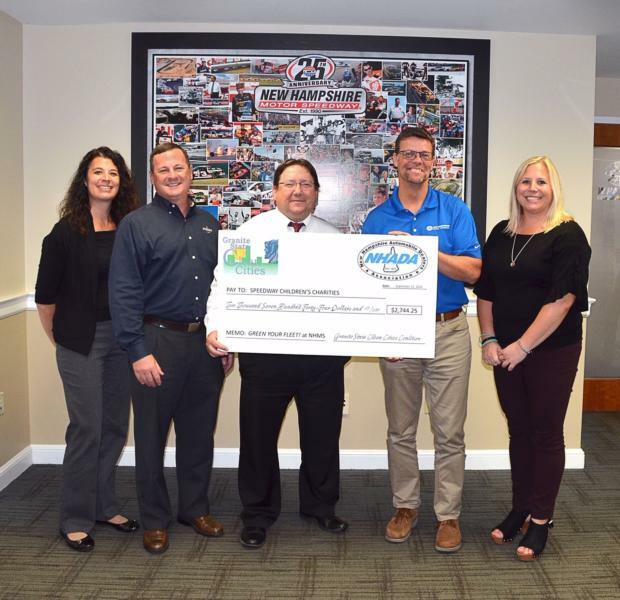 "Thanks to the overwhelming support of our stakeholders and sponsors, we were once again able to make this donation to SCC. It is an honor to be able to give back to our hosts, while raising awareness about the impact of alternative fuels and advanced technology vehicles on our nation's energy security, to have an opportunity to give back to an organization that is dedicated to children, who are our future, is a natural extension of our mission," says Jessica Wilcox, GSCCC Coordinator. "We know these funds will be used by SCC to improve the lives of young people in New England."